It feels pretty bittersweet to be blogging my last session with the Schwarz family before the Navy takes them back to San Diego. Katie and Steven really wanted to plan a session to celebrate their time in Pensacola and capture some of the activities they enjoy here. 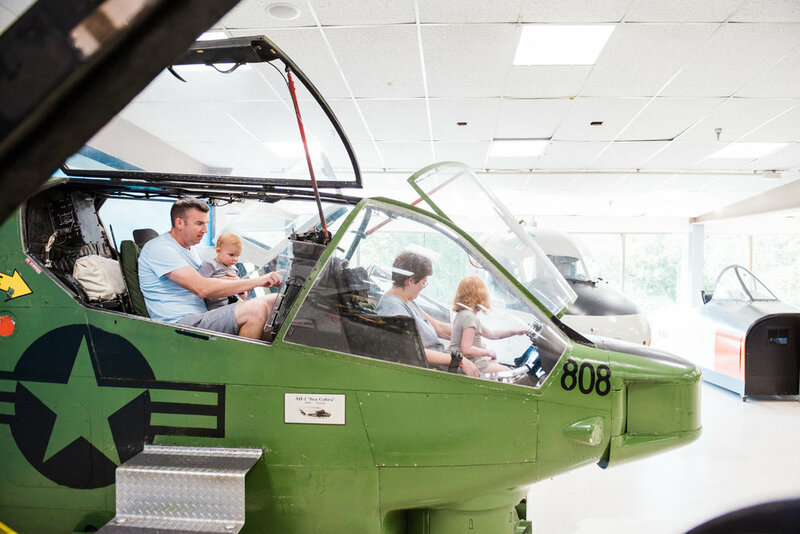 Ultimately, we identified the Naval Aviation Museum and Fort Barrancas as favorite spots for family outings. We knew we'd want to get to the museum as soon as they opened for the best chance of avoiding crowds. So, with Fort Barrancas not being open early enough to explore before the sun is too high and harsh, we settled on exploring the Advanced Redoubt. Katie also mentioned that Steven has started a little Saturday morning tradition of bringing home donuts for breakfast and we decided to incorporate a little breakfast picnic into our time at the Redoubt. Seriously guys. I can't even express how much I love working with the Schwarz family. They are unfailingly relaxed and genuinely happy to be exactly who they are in front of the camera. They never look to me for directions or ask 'what should we do next'. No one worries if the Declan throws dirt or Rylee carries a stuffed puppy around for the whole session. They just set off on whatever adventure we've planned, roll with whatever happens, engage with each other, and treat our time together just like any other fun family day. Life changes so rapidly and traditions shift and change as kids get older. Who knows how long it will be before Rylee is saying to them, "Remember how Dad used to go and get donuts for us every Saturday?" These little things you do together, that you can't imagine not going on forever, will eventually be phased out. Lazy Saturday breakfasts will give way to the mad rush and a pop tart in the car on the way to soccer games. Time spent playing and exploring as a family will one day be eclipsed by part-time jobs and hanging out with friends. This time that you have to capture your family really and truly enjoying everyday life together is short. One day they will be way too cool for dance parties on a museum catwalk...too cool for you parents. So take a page from the Schwarz family book. Embrace the imperfection and make it a point to have your everyday moments documented. Eat donuts. Get dirty. Dance in public. Just plan to celebrate and showcase whomever your family is right in THIS moment. Speaking of moments, take one now to leave a comment for Katie and Steven so they can earn a print from this adorable session. Once 50 people have commented, the Schwarz family will receive a FREE mounted 8x12 print. Whoo hoo!